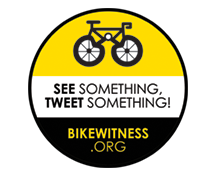 Bike Witness: See Something, Tweet Something! BikeWitness.org was developed by brother-sister personal law firm duo Flanzig and Flanzig, LLP, also known for their meaningful commitment to putting themselves out of business through heavy weight advocacy efforts throughout New York. Flanzig & Flanzig created BikeWitness.org to provide a worldwide platform that allows bike crash victims and bike crash witnesses a simple and easy way to find each other after a crash. They came up with the idea for BikeWitness.org after noticing difficulty in obtaining witness information. "The crash victim may have been able to only obtain a first or partial name, an incorrect phone number, or was so severely injured they were unable to ascertain any information after the event. We also started to notice an increase in the failure of the police to properly investigate the crash and obtain witness information. Although our client knew there was a “witness”, they could never ascertain their identity. This site now allows the opportunity for the victim and witness to find each other minutes, days or weeks after the crash. A sort of “missed encounters” for bike crash victims and bike crash witnesses. " Click here more information and to access BikeWitness.org.